Hamburgers are standard American fare but that doesn't mean they can't be exceptional. With a little effort, even a day-old burger can approach foodie nirvana. Successfully reheating a burger typically doesn't require much more than the original preparation tools and aluminum foil or a paper towel. Cooked hamburgers should be placed in the refrigerator, covered, within two hours. 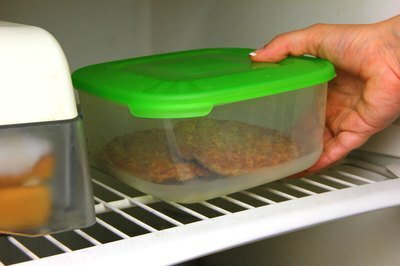 Patties can remain in the refrigerator until they are reheated; for maximum moistness, remove them up to one hour ahead of time. Keep them covered while on the counter. The USDA Food Safety and Inspection Service states that reheated hamburgers should reach 165 degrees Fahrenheit internally, regardless of heating method. 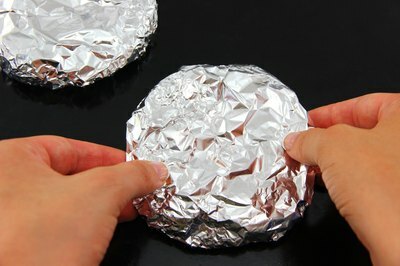 Individual hamburger patties can be reheated in the oven, wrapped in aluminum foil to preserve moisture. You may top it with a smeared teaspoonful of any steak sauce. Alternatively, wrap the burger in a large iceberg lettuce leaf inside the foil. Heating at 300 degrees for 10 to 12 minutes adequately heats most burgers. If you wish to melt cheese on top, open the foil a bit and place the foil and burger topped with cheese on a cookie sheet for the final four minutes of cooking. To use a griddle, heat it to 275 degrees or low heat. Sprinkle one teaspoon of water or steak sauce on the patty and tent the patty with aluminum foil. Keep the meat against the griddle surface and flip after three minutes. Heat an additional two minutes and check for desired hotness. 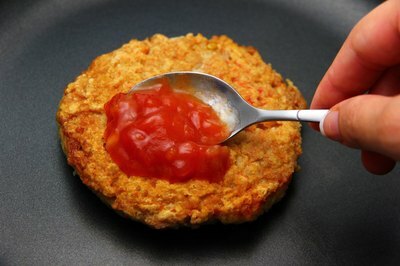 To use a skillet, place the patty in a cold skillet over medium-low heat. Add a teaspoon of water or steak sauce atop the patty. Keep the skillet lid on and flip the patty after four minutes. Add cheese if desired and remove the hamburger when it is thoroughly heated. To heat the meat in the microwave, wrap the patty in a white, damp paper towel and place it on a plate. Heat it at 50-percent power. Check for the desired temperature after 30 seconds and continue heating if necessary. If cheese is desired, open the paper towel, add the cheese and heat the patty another 15 seconds. 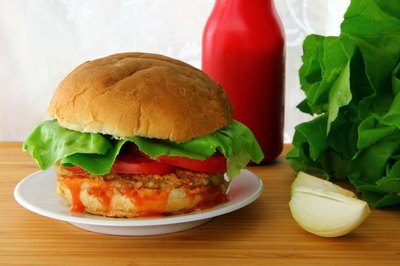 If you're planning to reheat a batch of burgers for a party, begin with hamburger meat that is no less than 80-percent lean and avoid cooking them until they are dry or more than well done. The day of the event, heat the hamburgers in an oven heated to 300 degrees in a covered dish or pan. Check the burgers' internal temperatures after 15 minutes. Restaurant hamburgers may take on a new life overnight -- a scary one. If you're trying to resurrect what used to be a hamburger, leave it on the counter for 30 minutes to allow it to come to room temperature. Carefully take it apart and scrape any condiments off the bun, if possible. Toss wilted lettuce and dry tomato slices with a paper towel. Pickles and onions typically survive relatively unscathed. The best option is to pop the burger in the microwave, wrapped in a damp paper towel. If you're feeling ambitious, heat the inner surfaces of the buns on the griddle. Add fresh condiments and your reassembled burger should be edible. A leftover burger may be boring. To add some excitement, make a swap from yesterday's fare. Broil and butter the bun, create a flavored mayonnaise, swap dill pickles for sweet ones, add spinach leaves or top with sauteed mushrooms.